If each of us takes part in caring and sharing, the overwhelming challenge of poverty can be addressed. Alone we can do so little, but together we can do so much. Ending poverty is a journey with many routes. Find new and exciting ways to get involved and make a difference in the lives of others today. Your time, talent and treasure is multiplied when you work with others in the spirit of Bayanihan. Build hope on ground and be an active part of this nation’s journey out of poverty. Gawad Kalinga Community Development Foundation, Inc. (GK) is a Philippine-based movement that aims to end poverty for 5 million families, by first restoring the dignity of the poor. Gawad Kalinga is a global movement of nation builders who are committed to expanding the work and advocacy of caring and sharing across countries, to build a better, safer and kinder world. 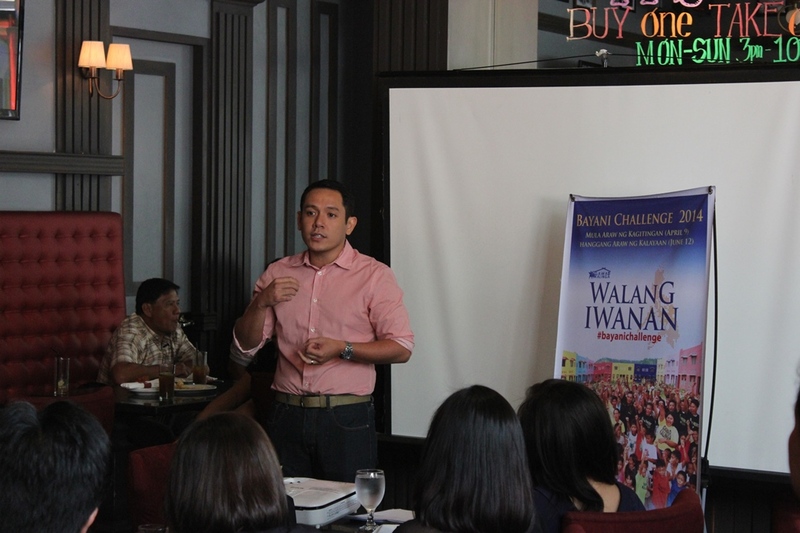 Last March 14, 2014 at Bugsy’s Bar & Bistro, Makati City, Gawad Kalinga (GK) officially launched the Bayani Challenge 2014 (BC 2014) to its corporate partners and friends. The kick off highlighted the instrumental role of the corporate sector in helping raise the One Million Volunteers who will help rebuild Yolanda-affected areas this summer. Not only do GK’s corporate partners provide the financial resources to build villages and support the event, they also rally their employee workforces to form their own teams and volunteer on-ground. Over the past few weeks, GK has been going around the country and holding similar sessions to invite various sectors of society (e.g. schools and universities, national agencies and local government units) into this extraordinary showcase of solidarity. Every year since 2006, Gawad Kalinga has convened the “Bayani Challenge” (Heroes’ Challenge) – a 5-day adventure of building the nation and making hope concrete for the poor. 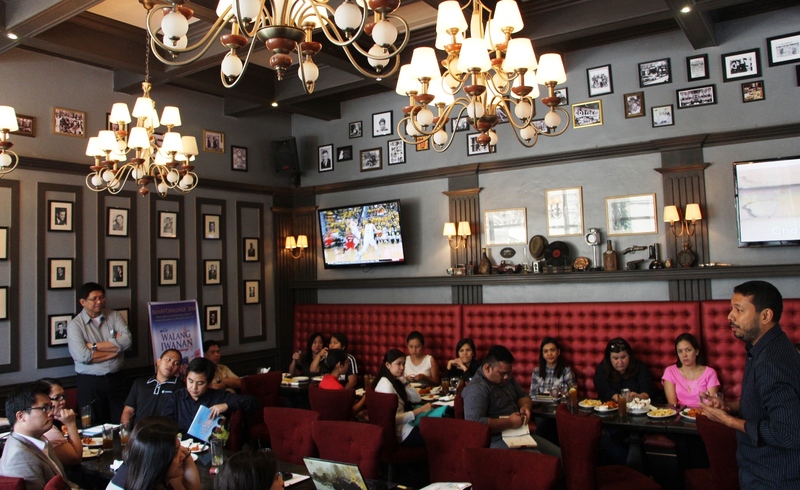 It was a full house in Bugsy’s as Ace Saatchi & Saatchi, Aguila Auto Glass, AIM, Canon, Century Pacific, Ms. Cherrie Mercado, Citibank, EGG, Globe, Golden Donuts, Human Nature, Interaksyon, JTI, LBC, Lean Process Inc., Monsanto, PDC, Schneider, Teleperformance, and Thomson Reuters graced us with their presence. Ms. Mikee Cojuangco-Jaworksi, a GK advocate, also came to support the event. As part of the program, long-standing supporters of GK and of the Bayani Challenge took center stage and shared about their prior BC experiences. Human Nature (HN) Social Enterprise Department Head Mike Go was also there to share how HN has raised the stakes for this year’s Bayani Challenge. It started off with a bold commitment to sponsor 100 houses for reconstruction, without knowing where the resources would come from. had a concert. We sponsored a play. And now they’re sponsoring the Bayani Challenge as well. For years, Human Nature has teamed up with GK in developing world-class community organic farms (and products), providing sustainable livelihood for thousands of our poorest people. With Yolanda, the whole organization has truly taken to heart the challenge of rebuilding Visayas. The Ormoc site where the very first Human Nature-GK Village will be built is one of this year’s Bayani Challenge sites. Four years after it first sponsored the Bayani Challenge in 2010, Globe remains one of GK’s staunchest partners in mounting this massive showcase of volunteerism year after year. Moreover, at the height of the Yolanda relief efforts, Globe, via Globe Tattoo, was the first to commit 100 homes for reconstruction. The Globe Tattoo Village is located just a few hundred meters away from the HN-GK Village in Ormoc. During the kickoff, Globe Corporate Social Responsibility OIC Bong Esguerra shared how the partnership has evolved through the years, recently venturing into social entrepreneurship. Mr. Esguerra also took the opportunity to announce that Globe will build additional communities in other parts of the Visayas. “Ormoc, Aklan, and Cebu, we’ll be there. Indeed, this year’s Bayani Challenge is humongous – as it should be, granted the aftermath of devastation left by Super Typhoon Yolanda. Be the one to make 999,999 become One Million. Register now: www.bayanichallenge.com. 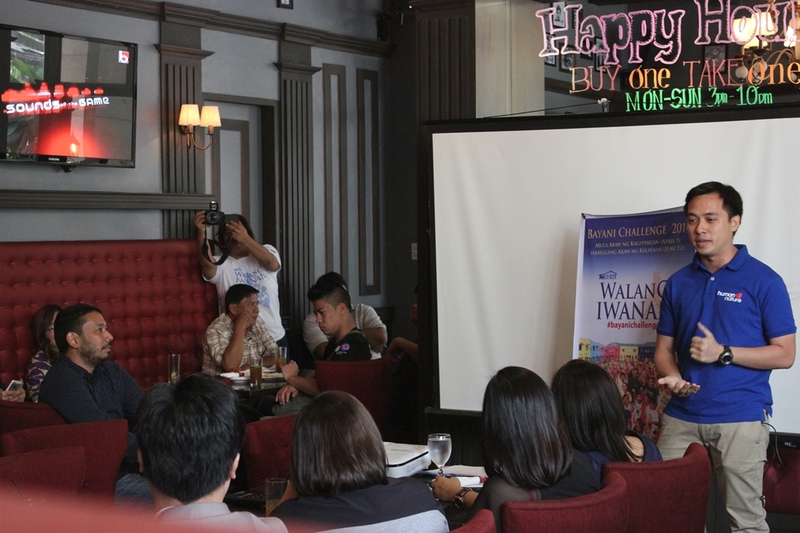 You too can be part of Operation Walang Iwanan and help GK in relief, rehabilitation and reconstruction. This coming summer, join 1 MILLION VOLUNTEERS in rebuilding Aklan, Antique, Bohol, Capiz, Cebu, Eastern Samar, Iloilo, Leyte, Negros Occidental, Palawan, Samar, and Zamboanga. Read more details about the Bayani Challenge 2014 HERE.